I had the same title on a post last year at this time so I guess now it is tradition. In this scene I am reminded how I meant to get out there and photograph the ice more than I actually did. It seemed that every time it snowed the timing was not right or I was committed elsewhere. Adding to the challenge was the record cold temps… the coldest since 1967 they say. It sounds like excuses I know and maybe it is! Now, with the first day of spring this Friday, March 20 I am feeling renewed enthusiasm to get outside with my camera. Welcome spring! Beautiful colors and great leading line! Thanks for coming in for a look and taking the time to leave a comment Deb! Hey… very nice farewell to the cold…. your shot definitely warms me up!!!! Love that beautiful line, it just leads the eye right through the comp. Thanks Mike! The line is what attracted me. Please forgive the corning image title! Good quote. One certainly starts to wonder after a tough winter! Thanks very much for visiting! It’s amazing how a well placed line and the right color can turn a photograph into something magical. I echo your sentiments about spring… Bring it on! Thanks Rich. Yes, looking forward to seeing some green! An absolutely beautiful view. Thanks! I’m glad you like it Isabel. I appreciate your comments. 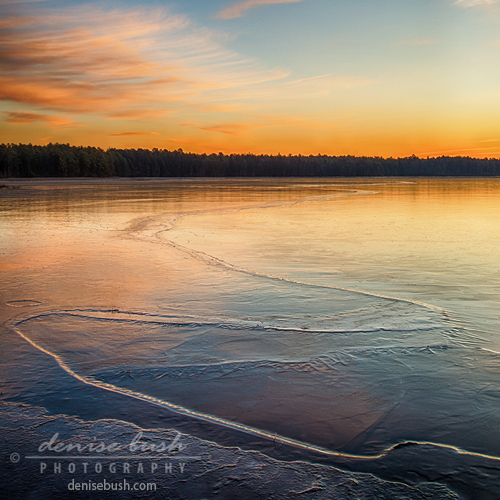 I love the mood and dawn’s color on the ice. Thanks Ralph … man was it ever cold that morning. At sunrise the coyotes stopped howling and the snow geese started squawking. I like the meandering course of that prominent seam in the ice. Thanks Steve. That’s what I was going for! I appreciate you taking the time to come look and comment. Beautiful moments you captured, I loved it. Thank you and also thank you for visiting my blog too. Have a nice Spring, with my love, nia. Thank you Nia. I’m glad you like the image and hope you have a nice spring too. Getting out to shoot in the winter seems so much more attractive as we approach better (warmer) weather. I’m getting ready myself for another great shooting season. It seems more attractive from the comfort of our warm homes too! Happy spring shooting! Very nice image, one of the best examples of a leading line that I’ve seen. And the transition of color from the cold blue of the frozen lake to the warmer tones of the sky really tell the story of the changing season. Thank you Robin! I always love hearing from you! The colors of winter. A beautiful capture. Thank you Russ. It is always nice to hear from you. Happy spring (almost)! Such a beautiful image. Those colours are amazing, and I love the way the ice draws you in. Thank you for the kind comment Brian! Beautiful image that warms the soul – love the lines in the melting ice. Happy Spring! Nice to hear from you Ginny and hope to see you soon… thanks. Great composition! Ditto to all above comments. Thanks Rich, I appreciate the visit. I’m glad you like it! What a joy to kiss winter good by and welcome in spring. Beautifully composed image – a fitting farewell to Winter and welcome to Spring. Thank you Andrew. Nice to hear from you! A lovely warm image for Spring. Beautiful. Thank you Karen. Hope you are having a warm spring so far! We are having lovely Autumn weather in Australia at the moment, cold mornings and warm sunny days. Squiggly seam ready to crack winter wide open. I appreciate your visit and comments. Thank you very much.